madesmart 2-Tier White Lazy Susan is rated 4.0 out of 5 by 36. Rated 5 out of 5 by Thirdculturewife from Twirl your spices I love this spice stand because it’s quite sturdy and durable! I bought some mason jars along with it and stored some teas and seeds and it carries it quite well. I like that I can just twirl/ turn it to the item I am searching for rather than having to move things around looking for one item. Totally love it. Rated 4 out of 5 by Luckyduck4 from Turntable Better quality than I expected. Strong and turns smoothly when it has a full load. I used it for my medications. Rated 4 out of 5 by NeatHoarder from No more spice swearing I bought this for my boyfriend who would swear whenever he needed to find a spice in his cabinet. He really likes it and thinks he needs another one for another shelf. He thinks it would be even better if the center part was raised so that the middle was more useable. No more swearing though. Rated 5 out of 5 by Brecola46 from Pantry Organizer These Double Turntables are great! I used them in my pantry. They help keep my spices organized, accessible & highly visible. Rated 3 out of 5 by dreamweaver from Okay I can fit all of my spices on this turntable, and love the easy access. However, the product is cheaply made. It does not turn as smoothly as as I'd hoped and is at little shaky. The sticker that the product came with was huge and left its goo all over. Now half of the tables edge's have dust on them that collected in the goo. Not looking forward to taking all my spices back out and scrub off the goo. Rated 3 out of 5 by Burghard4 from Nothing special Will work okay, but doesn't turn very well at all. Since rotation is kind of an important element to a lazy susan, I can't say I am too happy with the quality. Rated 5 out of 5 by cooper2013 from Best turntable ever I used to have a 1 shelf turntable, but needed a 2 shelf turntable. I found one at the Container Store. It fits everything I need to put on both shelves. It organizes my pantry very well. Rated 4 out of 5 by Trying1 from Double turn table Great for storage and turns smoothly. Just a bit of a challenge to connect the two tables, but once connected stayed in place. I have two of them and really like them. Rated 2 out of 5 by quepaige from acceptable purchased for spices. holds a good amount. the issue is that it doesn't rotate smoothly. serves its purpose because its on my counter, but if was used in a cabinet, I would have returned it. Rated 5 out of 5 by Pixy54 from Compact organization This turntable's non-slip surface ensures bottles don't slide around and the turntable smoothly spins (unlike others). 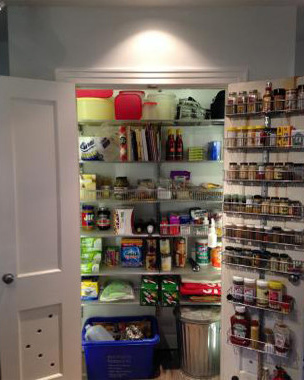 Rated 3 out of 5 by lglastorl from Little Lazy Susan I like this for use in our pantry, and would consider another for our fridge. Not unlike any other product with similar use; it does its job. Rated 5 out of 5 by ContainerStoreLover12345 from Awesome product! This product has made searching more spices a breeze. With one spin I can see all of my spices so I can pick the exact one I needed with ease. Rated 5 out of 5 by SKGK from We bought the 3 level turntable to store my boyfriend's enormous collection of cologne for underneath his bathroom sink! Perfect idea! Rated 5 out of 5 by ekim818 from Who doesnt need these? Used every day! I put my spices on here and it makes everything more organized and easy to find. I have both the double and single. Con to the double is you can only put smaller/shorter things on the bottom. You have to make the double one with a few of the parts but its a sinch and anyone could do it. Rated 1 out of 5 by cmp1 from Does NOT TURN! Poor Quality. Looks Cheap. Does not turn. Disappointed. Rated 3 out of 5 by jslkim from Poorly Made Although I just use it because it is the right height and diameter for my cabinet. The turning mechanism is poorly made. The traditional wooden ones are much better if they fit your cabinets. Rated 5 out of 5 by PTag from In the pantry I have this in the pantry. makes it easy to double stack cans and still be able to see all of them. Rated 4 out of 5 by SOdell from Practical This is a very useful item for the kitchen. Just be careful putting it together. The three connecting slats have tabs that are not that strong and can snap when pushed too firmly. I learned this the hard way. Rated 1 out of 5 by OrganizeU from Dissapointed I was replacing some turntables I had for years and this brand was such a disappointment. It doesn't spin smoothly like my old ones. More like a wobble spin. It is made much cheaper and I'm surprised The Container Store would carry such poor quality. Rated 2 out of 5 by KarenZ from Doesn't spin well, didn't like assembly So this comes in pieces that you assemble. Which would be fine, if I didn't feel like I was breaking the thing to assemble it. And the sticker goo is terrible. Literally 60% of the edge was covered in stickers. But most importantly, the thing doesn't spin well. Like literally when I try to spin it, it slides sideways across my shelf. Or it spins then hangs after turning an inch and a half. So disappointed. Oh! And a regular spice bottle can't go on the bottom rack without being turned sideways. So if you have bottles all the way around the rack, you have a problem. I'll try them for another day or two, but I'm pretty sure I'll have to return these stupid things. This item was inexpensive, but even at this low price, I expect the thing to turn correctly. Rated 5 out of 5 by Susy from Organized Medicine! I love this turntable! We have all of our medicine in high cabinet and it's been very difficult to see what we have up there until we got this turntable. I have all my toddler's medicine in one area and have organized the rest of the adult medication (eye drops, aspirin, allergy medicine) so it's easy to access. I faced all of the labels outward so we can see what we have and it makes it so much easier to find the medication for my toddler boy when I'm looking for it in a hurry! Rated 5 out of 5 by Lov2organize from Love this product! It turns beautifully, cleans up easily, and overall is very space conscious. I use it for spices and couldn't be happier. Rated 5 out of 5 by lnyn from double turntable I've been looking for these and happy to find them. Great for spices, the perfect size. Can u show me it's package? Is it fixed ? What is the height between the two turntables? Would regular sized canned foods fit? The space between the bottom and top tier measures 4-3/8&quot; high. on average, how many spices does this fit? Each level of our 2-Tier White Lazy Susan by madesmart has approximately 75 square inches of storage space. Since spice bottles and tins are available in a wide variety of shapes and sizes, we are unable to say how many spice containers a single shelf will be able to accommodate.